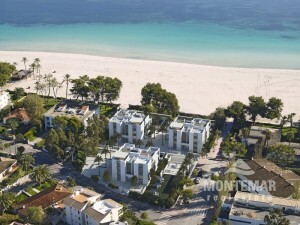 Luxury Apartments for Sale in Alcúdia | Montemar S.L. The large number of beaches and bays in the municipality of Alcúdia alone symbolize the Mediterranean life that is possible in this village in the north of Mallorca. To name but a few examples, there is the Platja d' Alcanada, Platja de Sant Pere and S' Illot. There are truly many choices to buy your own apartment in Alcúdia, guaranteeing proximity to some of the most beautiful beaches, but also the charming old town centre itself. Behind the gates and walls of the modern city, it quickly becomes clear that local history goes back a long way - no wonder, as Alcúdia is the oldest settlement on today's holiday island. The municipality of Alcúdia includes not only the town of the same name, but also the port of Port d' Alcúdia, Platja d' Alcúdia, Mal Pas - Bonaire, Marina Manresa and Son Fe. Alcúdia is also a cultural centre with many attractions and promises to offer a varied life for visitors, residents and holidaymakers who want to create their own vacation paradise with their own apartment. Buy one of Montemar Real Estate's great apartments in stunning locations and facilities with no risk.